'THERE IS INSUFFICIENT DATA FOR A MEANINGFUL ANSWER.' "
-I've reviewed two novels lately that are often labeled as “classics” - the first one being ”The Road”, an ingenious near-future post-apocalypse survival story, and the second is “The Forever War”, a much praised military sf that won many prestigious awards. Of course genre “classics” don’t grow on the proverbial tree, but being a fantasy and sf promoting blog, I believe it best to start with the best that can be found. 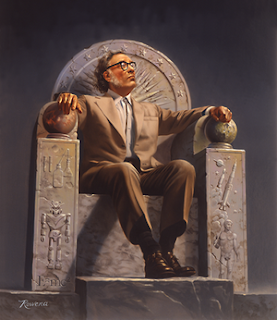 Isaac ASIMOV is another much lauded sf author, if not ‘the author’, out of the golden age of science fiction. His “Foundation” and “Robots” series have done much to separate the term “pulp” from science fiction, as well as made a big name for Asimov. In 2004, a big-budget (but ironically pretty pulpy) sf movie, starring Will Smith as Del Spooner, has been filmed after his novel “I, Robot”. What I’m offering here is one of his short stories - his most known short story that is also Asimov's favorite. “The Last Question” packs more meaningful content into no more than a few pages than majority of authors manage to accomplish in a lengthy novel. I’ve only read this one short story by Asimov, but it is pretty obvious why he is revered as a master of his trade. The story is short (doh!) and to the point. Asimov manages to touch upon a few topics of which relevance is universal and undiminished to the present day – a few examples: the nature of the Universe, evolution of mankind and technology, transcendence of embodiment and mortality. Some of his ideas are obviously outdated (an analogue computer of the size of a planet etc.) with others remarkably not so; even when concerning the present times. The story itself is divided into several shorter ones that basically deal with people from all across the future ages, all worried about the absolute end of Existence and with how to reverse the laws of entropy. At some point of the future all the big questions have been answered except for “The Last Question”, that would translate without the fancy words into something as simple as “how to make something from nothing?”. The answer, provided by an all-powerful computer that is in the beginning known as Multivac, but later takes other names, is always the same… The ending may be predicted by the most prescient readers, but not by me; and even if I could predict it I would still think it brilliant. I am talking about an old-school story in the best sense of the word and it throws a mighty punch at the reader. Not only should it take you no more than a lunch-break to read it, it is also absolutely free (link). Now, is there any reason not to read "The Last Question", any reason at all? this one totally deserves 5/5!